The University of Notre Dame’s Class of 2020 that arrived on campus this week is marked by a record of academic achievement and a passionate commitment to service and leadership. The 2,040 new students were drawn from a record pool of 19,505 applicants. The average incoming first-year Notre Dame student is in the top 1 percent in the nation in academic high school performance and/or national testing. More globally representative and diverse than any previous incoming classes, 34 percent of the Class of 2020 are students of color or international citizens. They are graduates of 1,316 different high schools. Eighty percent of Notre Dame’s first-year students are Catholic, and 22 percent are children of Notre Dame alumni. While they were in high school, 35 percent headed a student organization, 45 percent were captains of a varsity sport and 50 percent were involved in music, drama, fine arts or dance. This year’s “yield rate,” the number of students who enroll after being admitted to Notre Dame, was 56 percent, which places Notre Dame among the top 10 private national research universities for yield success. The Class of 2020 will arrive at a campus bustling with construction and renovations. Dunne Hall for men and Flaherty Hall for women opened in August for the 2016 fall semester. Both new halls are located in the northeast quadrant of the campus, near the Hesburgh Library and the new McCourtney research facility. Dunne Hall is just north of Flaherty Hall. 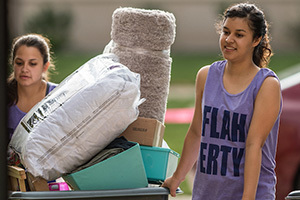 Each building is approximately 71,000 square feet, with accommodations for 226 women in Flaherty Hall and 221 men in Dunne Hall. McCourtney Hall, a 220,000-square-foot facility that is the first of a planned east campus research complex for the Colleges of Science and Engineering, will be dedicated this fall. The hall will become the home to the departments of chemical and biomolecular engineering and of chemistry and biochemisty. The three-story building includes two wings and a central core for faculty offices and conference rooms, and some 100,000 square feet of open laboratory and team spaces. Work continues on the Campus Crossroads Project, which adjoins and enhances the Notre Dame Stadium on its west, south and east sides. The Duncan Student Center, on the stadium’s west side, is designed to complement the facilities of LaFortune Student Center. Its nine stories will enclose 400,000 square feet of space for a new hub of student life at Notre Dame, housing flexible, state-of-the-art meeting rooms, graduate and undergraduate student lounges, a dining area and administrative offices for student organizations. Two of its levels will include recreational sports facilities as the Rolfs Sports Recreation Center becomes the practice home for Notre Dame’s men’s and women’s basketball programs. On the stadium’s south side, a new six-story building will make possible the relocation of the University’s Department of Music from its present quarters in Crowley Hall, bringing it under the same roof as the program of Sacred Music at Notre Dame. Fronted by the Frank Leahy Gate grand entrance to the stadium, the new music building will include recital and rehearsal halls, a large and growing music library, classrooms, rehearsal and tutoring rooms, lounge space and administrative offices, and its location will place Notre Dame musicians in advantageous proximity to such campus venues as the Reyes Organ and Choral Hall and other arts facilities in the DeBartolo Performing Arts Center. Under construction on the stadium’s east side, the nine-story, 280,000-square-foot Corbett Family Hall will provide a home for the offices and laboratories of the University’s departments of anthropology and psychology. The new building also will house a digital media center with a 2,000-square-foot studio, numerous production, teaching and research facilities, and a control room to support such distinctive Notre Dame programming as Masses at the Basilica of the Sacred Heart, athletic events, arts performances and academic lectures. Jenkins Hall, which will house the new Keough School of Global Affairs, and Nanovic Hall, the new home for the Nanovic Institute for European Studies and the departments of economics, political science and sociology, are under construction on the southwestern corner of campus. Walsh Hall is undergoing extensive yearlong renovations, including window replacement and interior reconstruction. Originally published by William G. Gilroy at news.nd.edu on August 24, 2016.